"My name is JT Barber, I'm 18, and I marched with the Kiwanis Kavaliers in 2002 and the Blue Stars in 2004. 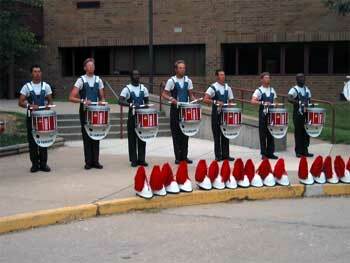 This is a picture of the 2004 Blue Stars snare line during our warm-up in St. Peters, Mo. From left to right is me, "Vegas"(2004 age out), Bruce, Jake, Dan, Dussl and Alex. We had a great summer this year and will make the next summer even better." Thanks JT!